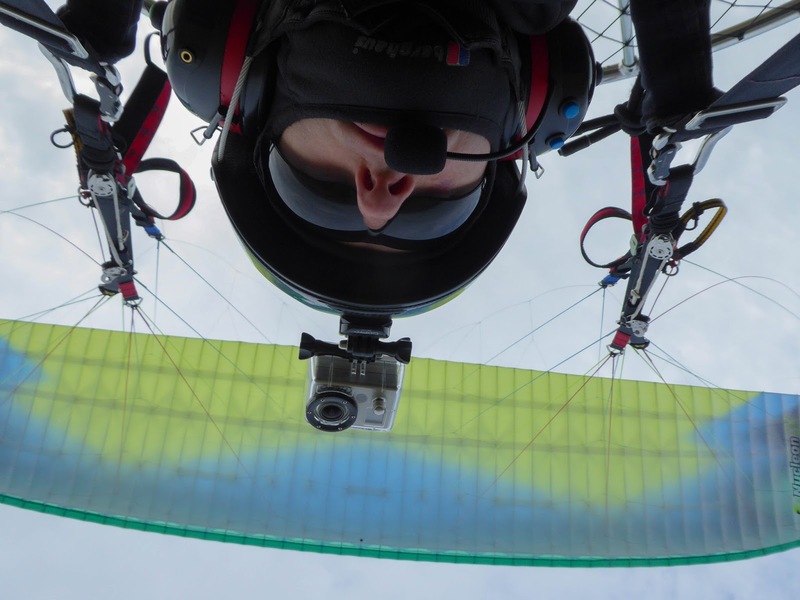 I’m a fair weather paramotor pilot who mainly flies in silky smooth air. 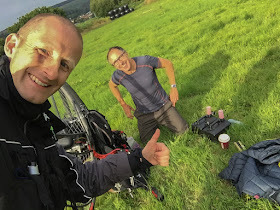 I knew the Icarus X adventure race was going to be a challenge mentally and push me out of my comfort zone, so leading up to the event I received some advice from fellow Challow Paramotor Club member Simon Walker who encouraged me to enter. Simon entered the event last year and shared some valuable advice. I monitored the forecasts in the week leading up to the race, I was only going to attempt it with a very decent weather window. The forecast was looking promising, so I started planning my itinerary during the week leading up to the event. This involved researching fuel stations on google earth strategically placed next to suitable fields along the route, this included 2 checkpoints we had to collect in Devon and Cornwall. 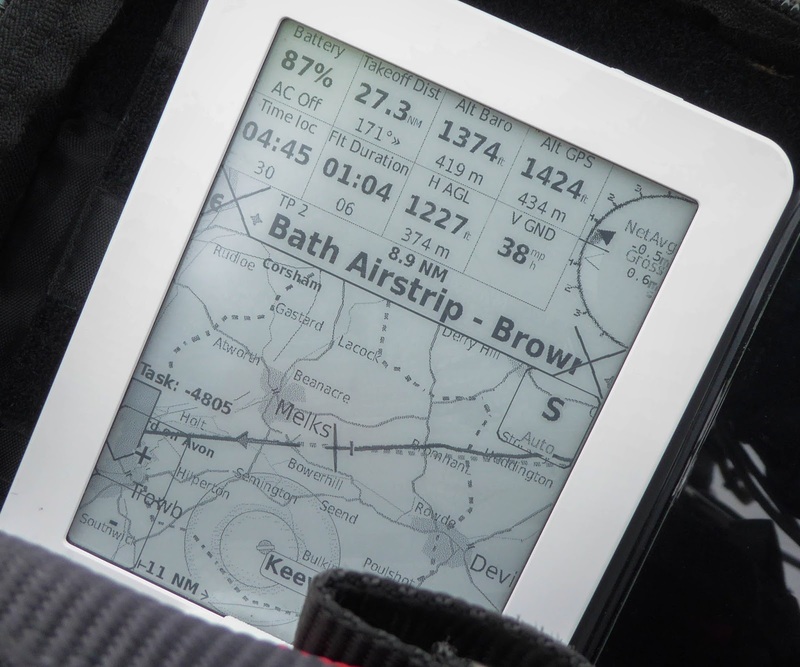 The route was uploaded to my new kobo flight computer and I organised some last minute camping preparations as we were expected to camp on route for at least one night. I’m now happy with my preperation and the forecast is looking promising, so I booked my place. I arrived at Pitney Airfield in Somerton at 12:00 on Friday 7th July, I completed final kit preparations before the race briefing at 14:00. 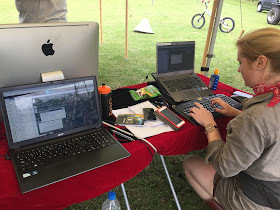 The briefing started under the shade of the Icarus HQ tent. 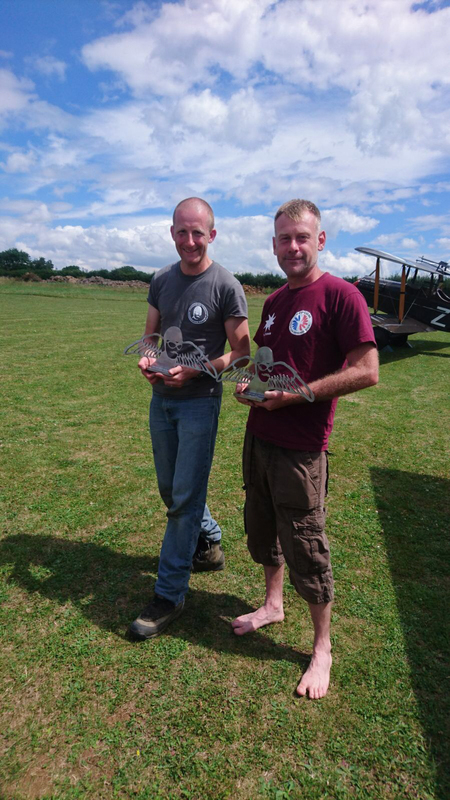 I was one of 16 pilots to enter, we all sat around and were advised about the race rules, airspace and safety. This also included instructions on how to use the Satellite trackers we were issued with. We also added our numbers to a list for a WhatsApp group so we could share our adventures with each other. At the end of the briefing we had to choose to take part in either race or adventure class. With the race class the rules quote - “Race Division pilots must fly unsupported and get there first to win”. With the adventure class the rules are a bit more relaxed so you can have, well an adventure! The rules quote - “Adventure Division Pilots must simply make it to the finish line. 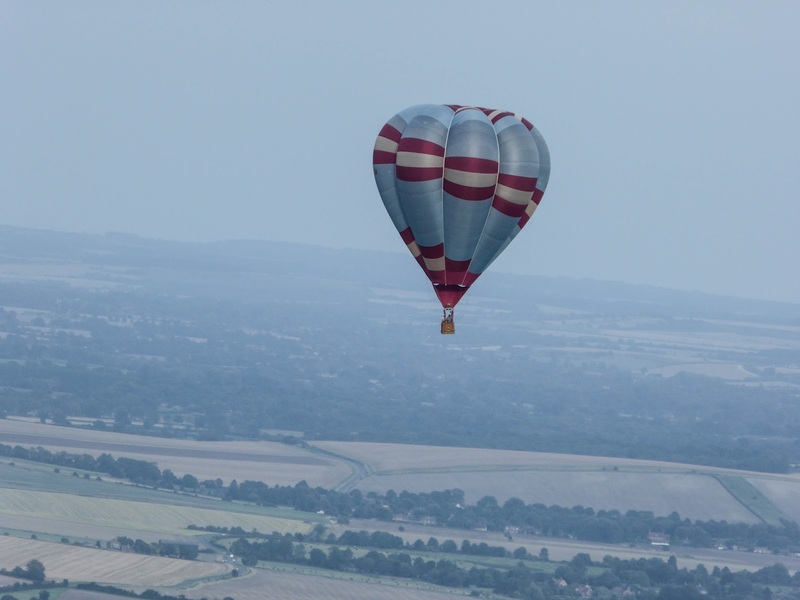 Pilots can accept outside support and travel forward using transport other than flying.” Well I’m up for an adventure, so I entered the Adventure class. The race started at 16:00, the winds were increasing and this is not helping with my nerves. A few pilots were ground handling to feel the conditions, a few other pilots got away safely and others had some failed launches, with gusts catching out another pilot who took off and then crash landed, he was fine, but the damage to the machine put him out of the race. Everyone was told to stand down, even the pilots on route received a message and were asked to land as soon as it’s safe. Looking at the increasing winds on the forecast I assumed that was it for the night, so I put my motor under cover and prepared for an early night. 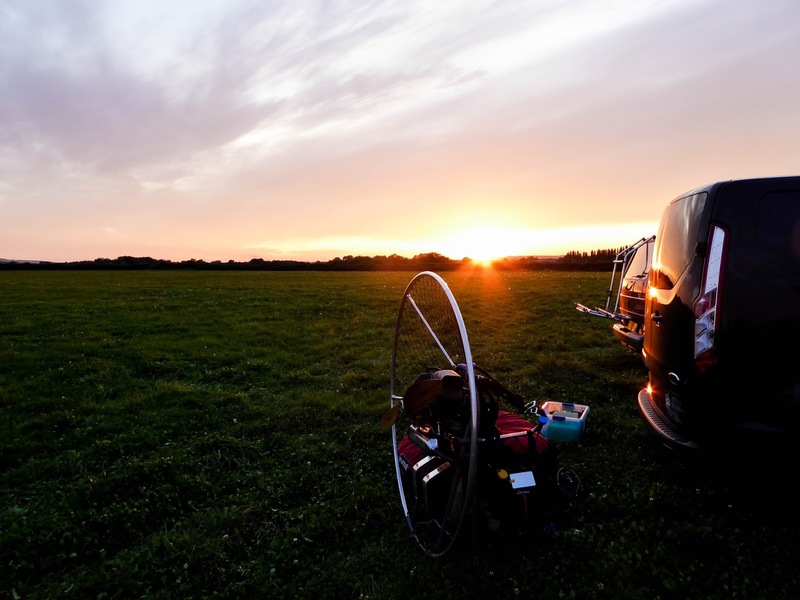 Sunset was drawing closer, but around 20:00 there was a mad dash as we noticed the gusts dying down, HQ advised we could now launch at our own discretion, so I decided to get set up, launch and make some ground. 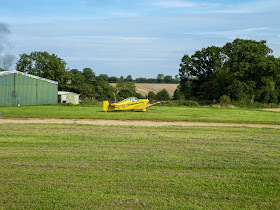 Take off from Pitney Airfield at 20:37, I headed NW, trimmers out to penetrate the head wind, Adventure class must land at sunset, so it was not long before I'm scanning for suitable landing/camping spots. I find a nice flat field and land about 21:10. I'm not far from Bridgwater and about 12 miles from where I started. I report back to HQ that I'm safe then walked to the nearest house, knocked on the door and tried to make them feel sorry for me with the hope they would offer me shelter. Instead they said it was OK for me to camp in their field and were nice enough to supply me with water, fruit, crisps and biscuits. With the fading light I rushed back to my kit and prepared camp, this consisted of a large tarp stretched over my paramotor and anchored with paracord and tent pegs. 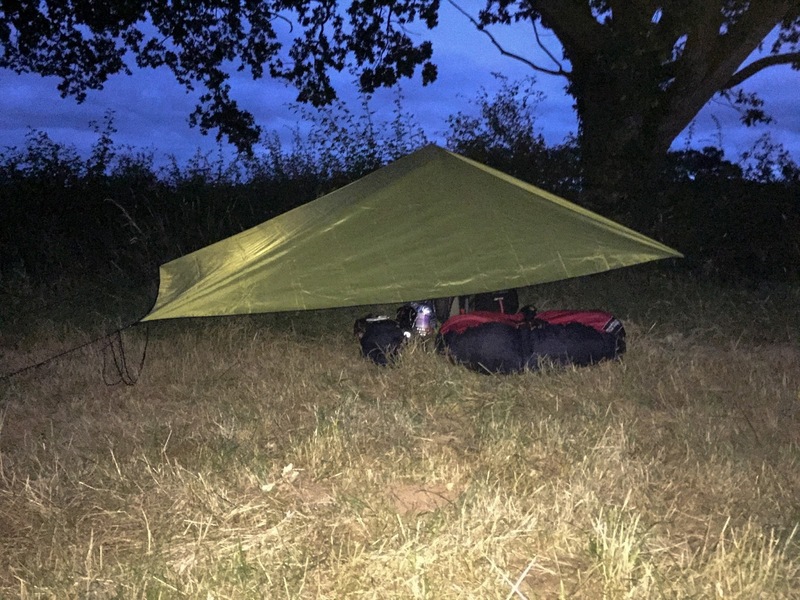 I didn’t have a sleeping bag or ground mat so I decided to rip up as much long grass as I could from the edge of the field and proceeded to lay it under my shelter for a bit of comfort, at least I was wearing my flying suit! I thought I was set for the night, however every time I closed my eyes I heard strange munching noises and started clapping my hands to scare whatever it was off. After about an hour of this I realised the munching noises were actually long weeds waving in the increasing wind scraping against the tarp! It’s now about 02:00 and I start to feel cold, so I spend another few hours awake trying to stay warm. Shortly after 04:00 I decided I’m not going to get any sleep and began packing up ready for the next flight. 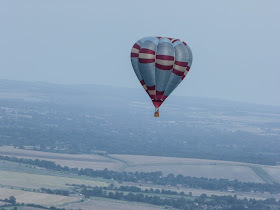 Flight 2 - From Random Camping Field, nr Bridgwater. As I didn’t sleep all night my energy was low, the wing was damp and this resulted in about 4 failed launches. 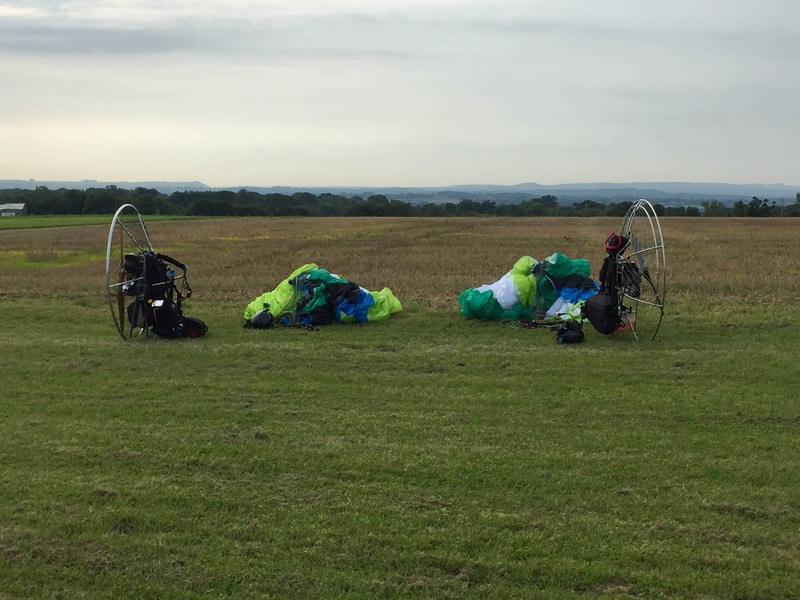 I finally launched at 06:20, this was 1 hour later than planned, I then headed for my first pre-planned fuel stop at Minehead. 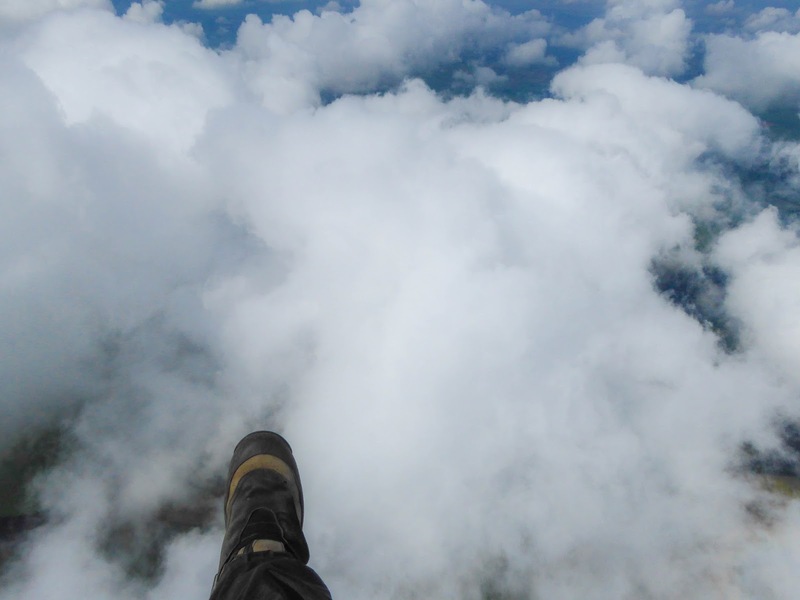 On route I had to navigate around a few rain clouds above the Quantock Hills and experienced some scary turbulence, so trims right out then! 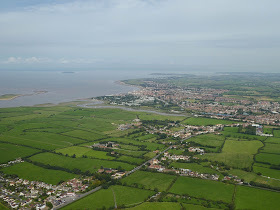 I make it over the high ground and continue on to Tesco fuel station in Minehead. 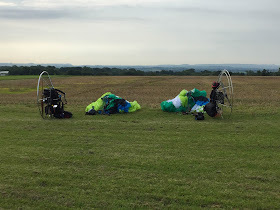 I could already see a few wings laid out in my pre-planned field, so I was a bit more comfortable landing there too. I'm safely on the ground at 07:30 and send the usual I have arrived safely message back to HQ. This was quite a popular field, Simon and a few other pilots were already fueled and ready to go. I was pleased I wasn't too far behind so I removed my fuel tank from my Bulldog Paramotor and dashed to the Tesco garage over the road. 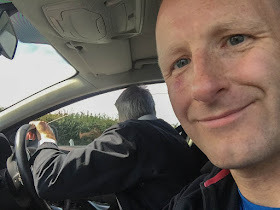 On arriving at the fuel pump with Tony Walsh, we were approached by a very angry local who was very aggressive. 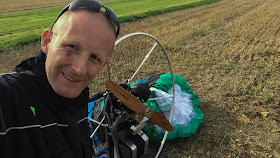 He was upset that a couple of noisy paramotors flew over his house at 05:00 and said it’s all over Facebook and he had called the police! He was on the verge of losing it, so I apologised, he then walked off cursing and blinding. Back at the field I prepare to launch, but things didn't go well. I was heavy with fuel, exhausted and the very low winds were not in my favour, so I was failing launches, then to top it all my flight deck strap broke, so I had to walk into town to buy a trouser belt which I modified to fasten the flight deck to my waist. With energy even lower, I needed some help, so I managed to thumb a lift back to the launch field from an old lady called Christa. Back at the field I spent a couple more failed launches and I was on the verge of giving up! 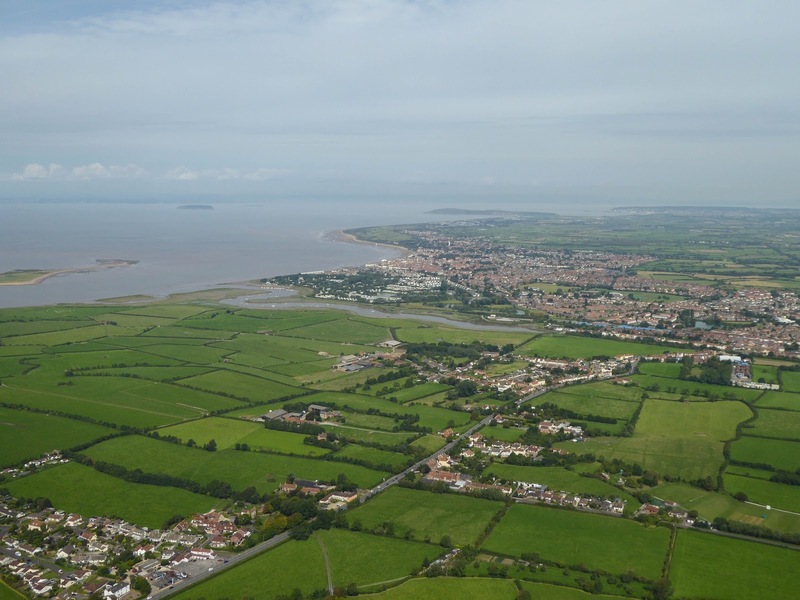 Finally I'm airborne from Minehead at 10:10 and start climbing the high ground in clear conditions towards Exmoor, passing over Samphire Festival in Porlock, this must be where Timmi Danger landed and gate crashed the party last night, what a legend! I'm now heading to my first checkpoint at Lynton by the Valley of The Rocks. I'm slowly getting used to the turbulence from the hills and valleys below, this would have me grounded back at home but I press on! 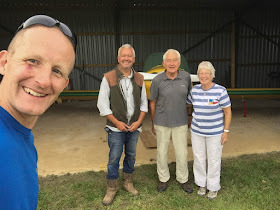 I land safely but not elegantly and was greeted by Tony Walsh who was out of the race with engine issues and off to find a local pub. Before he left me, he said “don’t forget to get your stamp from the microwave”, at which point my phone and GPS tracker starts pinging as HQ could see that I had stopped moving and I hadn't reported back. I immediately submit “I have arrived safely” messages on both devices and my mind is reassured that HQ are watching over me. I made my way over to the windsock which was waving in the gentle breeze above an old microwave, I reached inside and took out the tupperware box containing the stamp and applied the black Icarus X logo for checkpoint 1 onto my arm, whilst taking some video evidence for the WhatsApp group - success! I take off at 12:50 with a nice and easy launch and continued flying to Holsworthy, I got bumped around for over an hour, but the longer this goes on, the more I trust my wing. 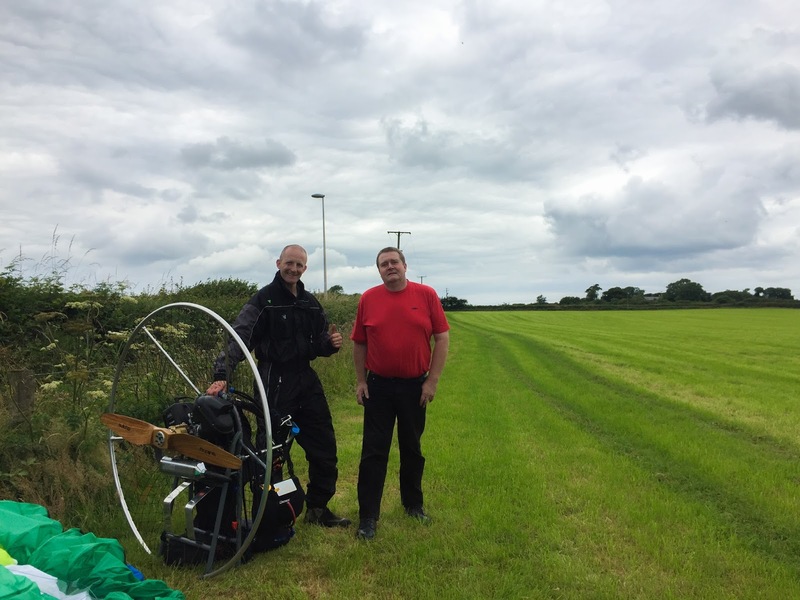 The weather was deteriorating as some clouds were looking and feeling nasty so I landed just outside Holsworthy village, choosing a nice big random field, I’m safely on the ground at 14:07. I send my arrival message back to HQ while watching a man jump out of his van and rushing towards me. I was relieved to find out his urgency was because he was concerned for me. We exchanged names, his was Lindsay and he wandered why I had landed. I told him about my adventure so far and asked if he wouldn't mind giving me a lift to the garage to get fuel. He agreed and brought me back to the field I launched from. We exchanged a few more life stories and I thanked him for his help, I asked for a photo for my memories, then he departed. 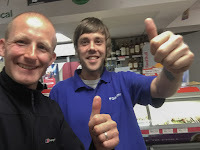 Very nice man Lindsay helped me with a trip to the fuel station. After many exhausting failed launches due to the light wind flowing down slope I finally got airborne at 16:55. 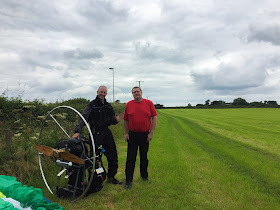 From here I flew through more turbulence with ever increasing confidence from my wing, passing over the disused airfield at Davidstow Moor where I saw lots of activity below, such as radio control planes, motor bikes and even another paramotor out for a local flight. 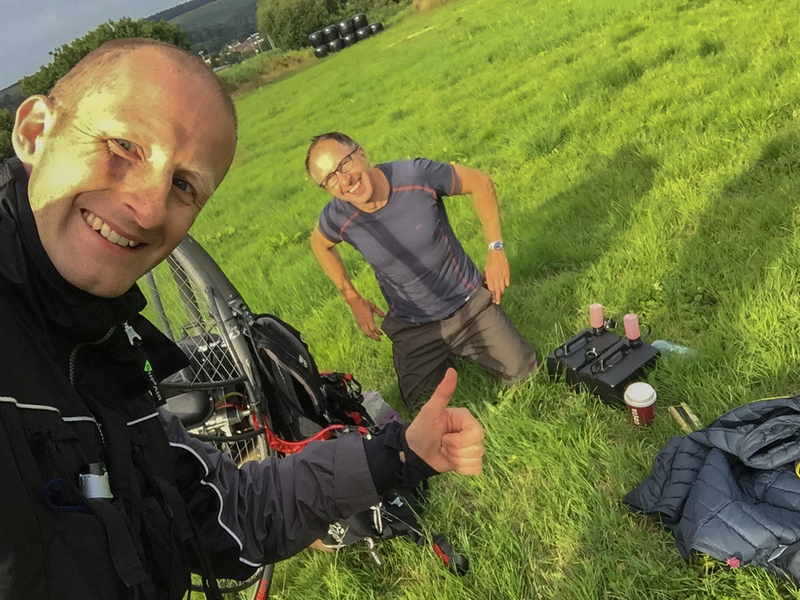 I press on towards the final checkpoint and land nicely at 17:57 into a nice steady breeze coming up over the hill. I send my arrived message to HQ whilst hearing nothing but sheep barring all around me. I then proceeded to get my second Icarus X red checkpoint stamp, this was in another tupperware box under a windsock. 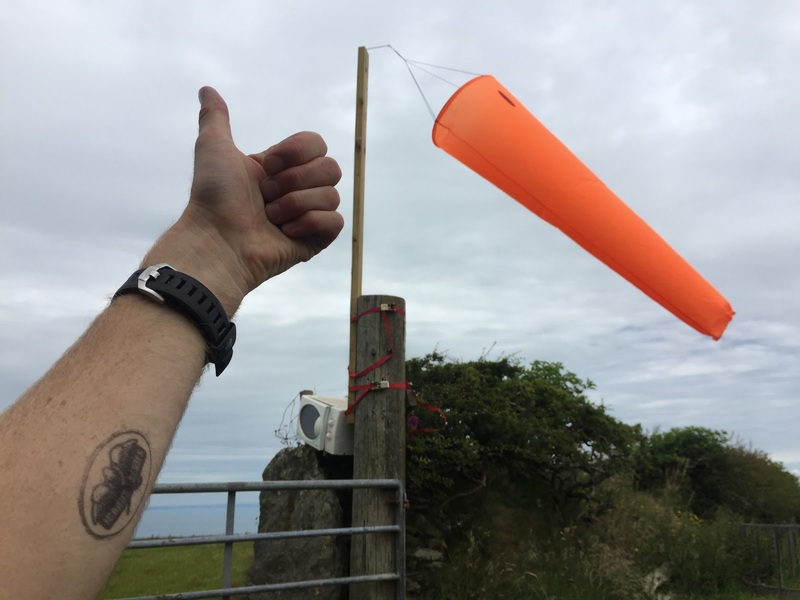 If I had arrived 30 mins later, I may have struggled to find it as a herd of cows appeared from nowhere and eat the windsock! 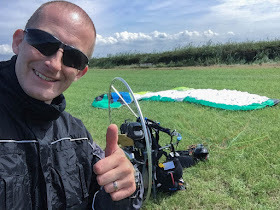 I’m back in the air again departing at 18:50, this time quickest launch ever, thank god for the nice reversible conditions as I didn't want the herd of cows to feast on my wing. I now head towards Bodmin Moor Service Station to top up with more fuel. Conditions are becoming smoother as it’s getting later, I continue over a few miles of barren land and was relieved to soon be flying over a main road. As I get nearer to the service station, I realise the field I planned to land in was all crop, so I had to put it in the next field, furthest away from the garage. 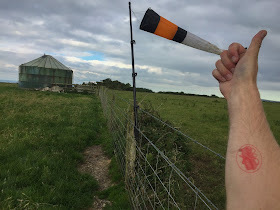 I land safely at 19:29, report back to HQ and proceeded to get more fuel, this required a short walk around the edge of the crop field before having to climb over the barb wire fence. Once fuel was sorted I took it back to the motor and set up for another flight. I tried taking off, but slipped on the dew which was quickly making everything damp, including my wing! That’s it, I report back to HQ that I’m camping again tonight, I’m now the last man out while everyone else made it back to HQ for a hog roast! At least I have the 24hr garage next door! 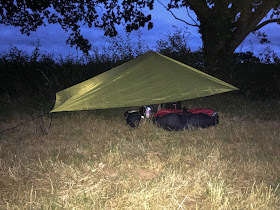 I set up the hammock between the gate posts and positioned the tarp over me and my equipment and prepared for much needed sleep. However I didn't sleep I shivered, this was much colder than the night before, but I stuck it out until about 04:00 and decided enough's, enough. I got my boots on and ventured back out to the warmth of the 24hr esso garage. Liam was covering the night shift and I told him about my adventure so far and how cold I was after trying to sleep in the field next door. I purchased some food and energy drinks, then returned back to the field to pack up camp. When I returned everything was so damp, I was tired and needed things to dry out to give me half a chance of launching. The fog continued to get worse and I realise I’m grounded. The only option now is to thumb a lift home, but first I need help lifting my gear over the barb wire fence. Luckily Liam was just finishing his night shift and offered to help me fetch my gear. Once I have my gear over the fence, I set out to strategically set up my flying equipment in front of the garage to try and get noticed by each vehicle that stopped, but no one was paying any attention so I had to change my strategy. I watched the main road like a hawk, waiting to pounce on any vehicle big enough for my equipment which was heading north. It didn’t take long as a 4x4 with a broken down classic car on tow pulls in and I eagerly rush towards it. I make eye contact with the driver and continue pacing towards him to beg for a lift anywhere north. It turns out he was going all the way to Bridgwater, this is only 14 miles from HQ and 10 mins away from my parents. I told him my story and he slowly opened up to giving me a lift. We loaded up the vehicle, exchanged names, his name was John. 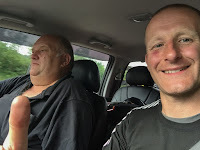 We then left the services and were heading north exchanging life stories. Back in Bridgwater I’m dropped off and await the rescue of Mum and Dad who drove me the rest of the way to Icarus HQ. I arrive back to HQ where the adventure began. Although I missed the main prize giving ceremony everyone waited for me as it turns out I had been declared the winner of the Adventure Class the night before. 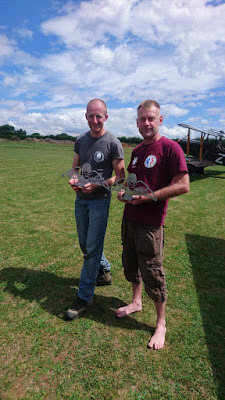 I received the trophy and posed for some photos with Mark Morgan who won the Icarus Race Class. What an amazing adventure!